My sis came to visit me the other day and we both had a major craving for SANDWICH CAKE! Our mom makes the best sandwich on this planet...maybe in the whole universe o_o! (At least that's our opinion :) Moms probably have some secret ingredient that make everything taste sooo good!) All I can say is ... mayonnaise... and lots of it! 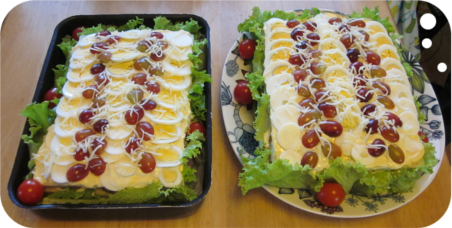 Me and my sis have never made sandwich cakes before (eating is a whole another story :P) So after phoning our mom and acquiring all the ingredients for this secret recipe (which will be kept as a secret..sorry^^) we head out to the local market. After some cutting, laughing, tasting, gossiping and getting mayo almost everywhere we were done! And here they are! The one on the left is my sis' "take away" version and the one on the right is miiiiine..all mine..!